high so why would anyone prefer a surgary beverage? your interest, there's a lot of information available online. I wish I had connected with sooner. I came back from looking it up. As I was reading the first description, I wondered if chaga would be good for eczema. Yep, it is. So, guess what I'm going to look for? Thanks for the tip. They sell Chaga in all different forms. I usually buy the chunks for tea. Also comes in tea bags. All the medicinal shrooms come combined with others in a tincture, etc. Pretty neat stuff. Interesting...is that anything like Kombucha? I suppose they could be considered in the same family as they are both mushrooms. The kombucha one is grown from bacteria, sugar, water and a little vinegar or some liquid of the last komucha batch. You can grow your own "baby or Scoby" or get one from a friend or buy one. The medicinal mushrooms are actually grown in the wild or you can plant the spores in logs. I tried to visit your blog but I don't know how to enter the google ones. I can tell, I'm going to have to keep a list of all your suggestions! The medicinal mushroom are super great. They really are like miracle workers. I LOVE mushrooms. Not the kind you pick off trees, but if they sold Chaga at Shop-Rite, count me in. Hahaha Yes you are, You certaily are. The Chaga are on the birch trees and they look and feel like wood so you have to actually saw them out of the tree. I guess you can even use a chain saw. Weird, huh? Interesting post. I like to read about medicinal things like shrooms and plants. Cool post. Thank you for visiting. It's a pleasure to meet you. I always do to. It's fun to see what people are interested in. What a super great topic, Manzi!!! I've been always curious about mushrooms and heard about fungotherapy as well. Once i even bought a facial cream containing extract of some japanese mushroom. It had such a pleasant mushroom smell! I'm so eager for the whole A to Z series of yours!! 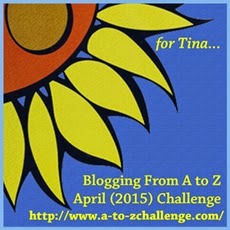 Yes, I finally came out of hiding so I can do the A-Z. Good to see you.You probably had Reishi mushroom in the fact creme. See upi around. Got me interested with the natural high:)) I did check the internet and that stuff is expensive. I will do some more checking. Thanks. All the medicinal mushroom are pricey but they really work like magic. I don't know a mushroom from a toad stool but just the last few years learned to love mushrooms to eat. Don't even know if there are any that grow here in south Texas that are safe to eat. Interesting post. Actually most people don't know the difference and neither do I so that is why we souldn't pick and eat them. I would like to know the big diff but it's so difficult to tell when you only have pictures to look at. Chaga is new to me, so I'll look it up. Thanks! I recall reading somewhere that Chaga was in the PDR until after the war when they purged all the herbs to make way for big pharma. We're so gullible. Lucky you with all the birch trees. I've never been fortunate enough to discover any chaga in the wild but from the vids on YT it has to be actually sawed out...... as with a chainsaw. They sell the tea in bags and also in smallish size chunks to make tea with. I get the chunks and make a large pot for the fridge. It is so delish and cooling on a hot summer day. P.S. You don't harm the tree because from what I read, the tree is already dead or on it's way out. We did go out today to do yard work and I did look for the Chaga, but I didn't see it. I'll still look from time to time. I've never heard of this particular mushroom --but I am aware of many other plants which have medicinal benefits. I'll have to check into this mushroom. Thanks for sharing. I've never heard of chaga mushrooms and didn't know a tea could be made from any mushrooms. I eat other mushrooms reasonably regularly, in salads in summer and in spaghetti sauce in winter. I miss your olive leaf tea!! you got me having a taste for that. That I didn't know. Will look into it. Love that prize.